Tommy Armour III grew up on the third hole of the historic Desert Inn Golf Club in Las Vegas, the son of a doctor and beauty queen, and the grandson of World Golf Hall of Fame member Tommy Armour, the Silver Scot. 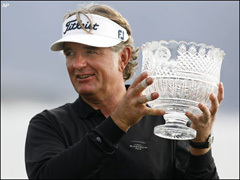 He played high school golf at Bishop Gorman, and has enjoyed a long and successful career on the PGA Tour, playing in more than 600 tournaments and earning more than $9 million through 2008. He broke the all-time PGA Tour scoring record at the 2003 Valero Texas Open, and is known as much for his flamboyant lifestyle as his low scoring and go-for-it attitude.